We know that a mechanic will guard with their life a favourite tools, but what do those in the trade recommend while defensively screaming “get your own? Shop mechanics frequently use workshop stands to help manage bike fixing duties, helping with gear setup, bar tape wrapping and almost every repair and setup activity. Many home mechanics have one too. 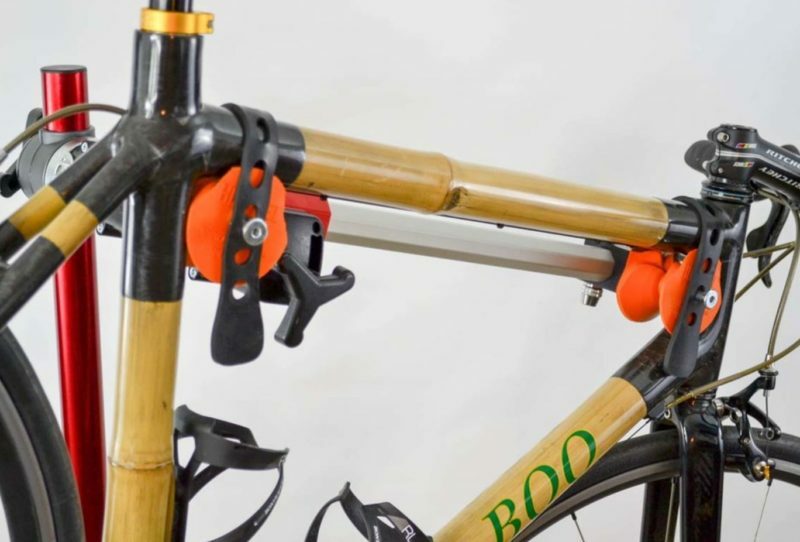 What happens if you have an exotic frame material like carbon, or bamboo, or perhaps a tandem or any other unusual frame shape? Sometimes a traditional set of jaws is not the right tool for the job, it might crush the frame or have nowhere suitable to clamp to. The Hirobel frame clamp serves to alter your perception about wrenching unusual shapes and delicate materials. 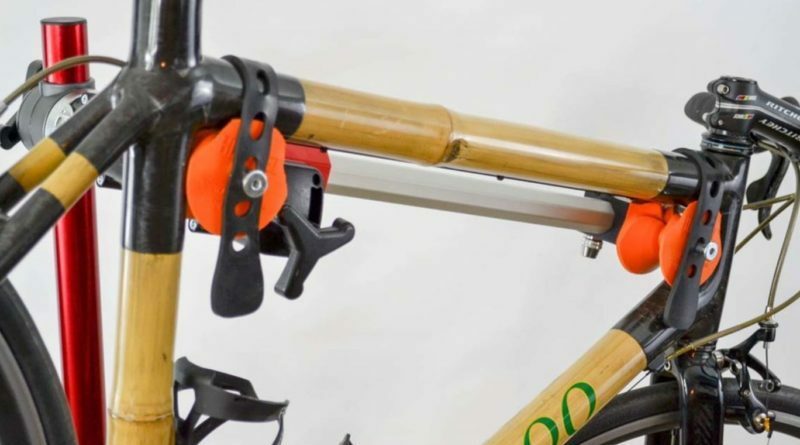 Instead of clamping tubes, it cradles them securely with two rubber V-shaped wheels that are quickly adjustable to the frame shape, with gentle tie downs for security. The clamp fits into your existing workstand jaws and does not twist, due to the shape of the Hirobel’s bar. One wheel is fixed, the second is on a quick release so can be adjusted to move up and down the bar to fit that specific frame shape. It’s all very simple and effective in its operation. Until you have tried to build up a carbon frame bike, clamping the seatpost to prevent compressing the tubes, (just ponder the sideways stresses on the seat tube) or have tried to clamp a large aero cross section tube in jaws that don’t open quite wide enough, you might not see the need. Believe me, the Hirobel offers a better solution. Its method places no clamping stress on butted and thin tubes, or bending on seatposts. 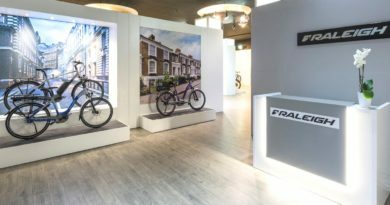 Conventional workshop stands are great and this does not replace one, yet if you have a jaw type stand, this enhances the capability and flexibility when building and maintaining all bike types. It works just as well with conventional shaped frames and materials too. It just stays in the jaws of the workstand. Do you need one? They are quite expensive but that shouldn’t be prohibitive. A customer seeing their frame cradled by a Hirobel will know that you care and want to protect and support the frame the best you can. Home mechanics might consider this too niche (or too expensive), again it really depends what bike(s) they have, how much they value the bikes and how much work they do on them. The Hirobel does appear to be designed to last a lifetime, as there is not a lot to wear out, so it may be a worthwhile investment for some. Find out more at hirobel.com. As we know from my previous article, I like a cool tool, but when you think hammers, you may say hammers are ten a penny, aren’t they? 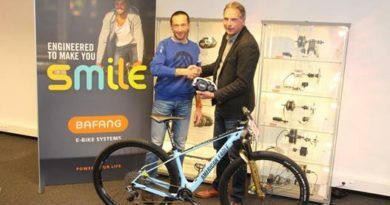 Well, not when Alex at Portus-Cycles in Pforzheim (near Stuttgart) decides to make his own to go alongside his custom frames. 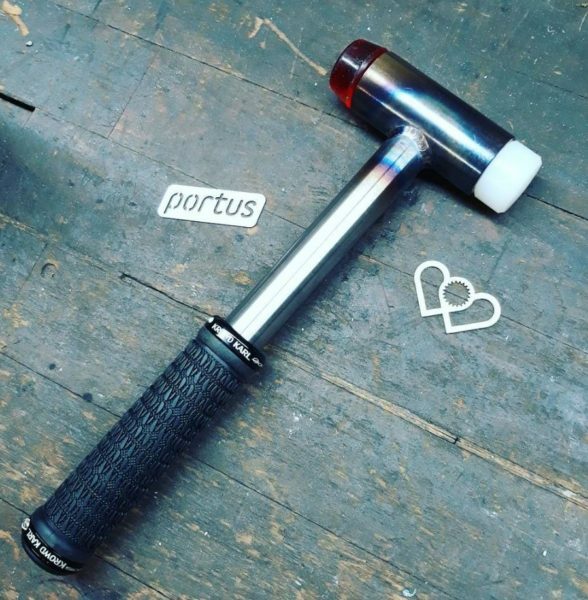 These mega hammers combining British Steel and German manufacturing techniques put even Mjölnir to shame. DER Hammer is manufactured from Reynolds 631 and the shaft is sized to take a standard bike grip, allowing you to customise to suit. The head is even filled with sand so won’t recoil like a normal hammer and has interchangeable heads. Have a HT2 crank seized in the BB that needs some kinetic love? Use a brass end. Local big legged rider known as #legsbenedict using an aluminium freehub body and the cassette won’t come off? Try the polyamide. Available with a clear powder coat only and weighing around 400 grams, DER Hammer will retail for around 89 Euro’s and production will start early March. It’s not for everyone. I’m sure there’ll be some that will STILL say ‘A Hammer is just a Hammer’, but with welds like that and steel that is most definitely real. I’ll be getting one. Have a tooling suggestion of your own that you’d like to see featured? The catch is, you must be a genuine mechanic and not a representative of the brand you’re nominating. If you’d like to share the love, let us know here.